All of those apps you run on your smartphones and tablets and the surfing you do from PCs and other devices ultimately ends up whacking some data center network somewhere in the world. 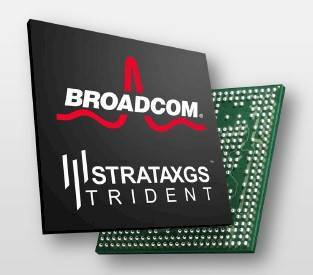 The appetite for bandwidth and low latency continues apace, and switch and adapter chip maker Broadcom aims to keep up with that demand with its new Strata XGS Trident II switch ASICs. As far as John Mui, senior product line manager at Broadcom, is concerned, the prior Trident and Trident+ chips set the bar for data center switching. Fulcrum's "Bali" ASIC is often used for switches with super-low latency and sensitivity to jitter, and many switch upstarts like Arista Networks use both Fulcrum and Broadcom chips in various parts of their lines. Broadcom counts Intel's Fulcrum Microsystems and Marvell as competitors. Cisco Systems and sometimes Hewlett-Packard are partners as well as customers for various switch chippery, while Dell and IBM also use Broadcom chips at the heart of some of their switches. For switch makers and their customers who are making the transition to 10 Gigabit Ethernet in the data center and eying 40 Gigabit Ethernet for uplinks and aggregation, the Trident II is going to be a welcome building block. In the old days of tiered networks, where you have core, aggregation, and edge layers, the data center was dominated by modular switches at the center of the network, and each of these needed multiple pieces of silicon to provider their bandwidth. These typically included multiple packet processors, a fabric processor, and packet buffers, among other chips. The Trident II, by contrast, is designed expressly for the "fast, fat, and flat" networks that data centers are now starting to deploy because they are dealing with high traffic between servers, particularly due to parallel processing jobs such as data warehousing or Hadoop data munching, as well as the very different traffic patterns that come from virtualized server clouds. This is commonly called "east-west" traffic because it is servers talking to servers, and it is in contrast with "north-south" traffic in a tiered network that is designed to use bandwidth to link servers to the outside world more than to each other. Broadcom is not revealing all the feeds and speeds of the Trident II ASIC for Ethernet switches quite yet, but the company is starting to sample the chips this week to customers and wants to give data center managers a peek at the kind of scalability and performance they can expect from switches that use the chip. The company is touting the fact that this is the first switch ASIC that can drive more than a hundred 10GE ports from a single chip, and that there is enough bandwidth in there to make a pretty fat 40GE switch, too. The prior Trident ASICs offered 640Gbps of Ethernet switching capacity, but the new Trident II will boost that to 980Gbps for some models and up to 1.28Tbps for other models. This is on par with the current Trident+ ASIC that Broadcom has been selling. The difference is that Trident II is designed to drive more and faster ports and has a bunch more features for the increasingly virty world. For instance, in a 2U rack form factor, customers will be able to drive 104 10GE ports from a single chip. Mui also says he expects for switch makers to offer machines with 96 10GE ports plus eight 40GE ports and 64 10GE ports plus 16 40GE ports in a 2U form factor, and even a monster 1U screamer with 32 40GE ports. The port-to-port hop latency is under 500 nanoseconds with the Trident II ASIC, and a 10GE port consumes less than 1 watt of juice as it is humming with data. The Trident II chip also sports something called Smart Table, which is the ability to store very large and configurable Layer 2 and Layer 3 tables. The existing Smart Buffer feature of the Trident+ chip, which creates a global buffer pool and automatically allocates memory to ports as they need it, is being enhanced as well. In this case, thanks to the smart allocation of buffered memory, running a typical 10GE workload, a switch with Smart Buffer turned on only needs a 7.6MB buffer to drive 96 10GE ports compared to a 40MB buffer that would be required on the same Trident II ASIC if Smart Buffer were not present. The chip also includes a new feature called Smart NV, which is short for network virtualization, not wishing you were brighter than you are. Broadcom helped cook up the VXLAN standard along with VMware and Cisco to virtualize the Layer 3 network and separate out Layer 2 networks on the fly, and the Trident II chip has support for VXLAN etched into its circuits. Specifically, the chip has a VXLAN transit switch and gateway. VXLAN is a Layer 2 overlay for a Layer 3 network that gives each Layer 2 segment a 24-bit segment identification called the VXLAN Network Identifier, or VNI. This 24-bit ID allows up to 16 million VXLAN segments to coexist on the same network administration domain, which is a lot more than the 4,094 VLANs supported with the current virtual LAN technology in Ethernet switches. VXLAN is made for clouds – very large clouds – while VLAN was made for regular-sized data centers. VXLAN can support up to 8,000 separate tenants, managing network isolation and providing quality of service provisioning for them. Smart NV also includes support for network virtualization based on the NVGRE standard being put forth as an alternative to VXLAN by Microsoft, Intel, Dell, and Hewlett-Packard. Broadcom is also helping to author this spec for Network Virtualization using Generic Routing Encapsulation, hedging its bets in case one way of virtualizing the network wins out over the other.